At Radixos, we work collaboratively across many disciplines. Our work both evokes and serves our client's goals, timeline and budget. 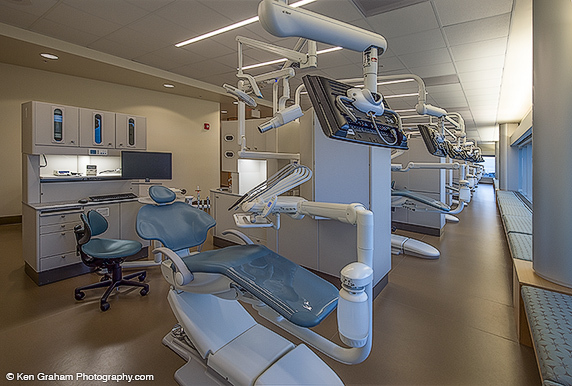 We help create places of human connection where the equipment and furnishings integrate with the overall design and function of the building. In each work area, we have completed numerous projects. The driving force behind our work effort is the belief in an integrated process, deliberately intersecting our disciplines of equipment planning, procurement and installation. This creates value, resulting in a smarter process and greater success for our clients. We have leveraged our experience and integrated processes to create successful outcomes that meet each project’s unique needs and aspirations. This facility is located near Arctic Circle, so there is a low angle of natural sunlight in spring/summer and minimal light in fall/winter. The previous facility had minimal/no windows making the facility feel claustrophobic and cluttered. Working with the Architect, Radixos orientated the chairs facing the windows to maximize light and the natural setting of the facility.